Collected here in this omnibus edition are three of Andrew Murray's books. These books include Waiting on God, School of Obedience, and The Two Covenants. Murray's writing is both timeless and inspiring. Waiting on God is Andrew Murray's wonderful thirty one day devotional that will help you come closer to God. The Two Covenants is a humble attempt to show what exactly the blessings are that God has covenanted to bestow on us. The School of Obedience shows us how to give ourselves up to a life in the abiding communion with the Three-One God, so that His presence and power work in us every day. Wisdom of Andrew Murray Volume II by Andrew Murray was published by Wilder Publications in June 2008 and is our 12029th best seller. The ISBN for Wisdom of Andrew Murray Volume II is 9781604594249. 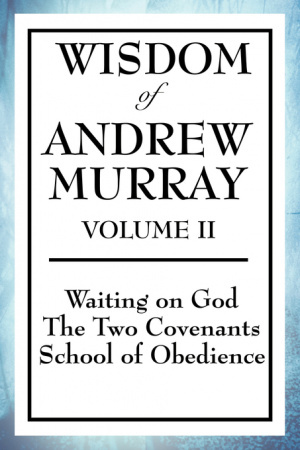 Be the first to review Wisdom of Andrew Murray Volume II! Got a question? No problem! Just click here to ask us about Wisdom of Andrew Murray Volume II.